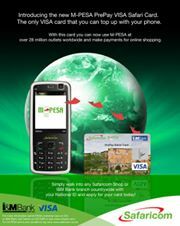 Did you know that it is possible to apply for and get an M-Pesa Prepaid Visa Debit card that you can use to withdraw cash in any currency from over 1.6 million Visa ATMs worldwide and to make purchases at over 28 million VISA branded shops and other merchant outlets all over the world? You can also use it to make purchases online. Anyone above the age of 18 with an M-Pesa registered line. A copy and original National Identity Card/Passport. The card can be reloaded initially with Kenya shillings and later via M-Pesa via the PayBill Business Number 541 541. Residual balances are also refundable at any I&M Bank countrywide.